Five weeks after the unveiling of the new home kit for the 2018/19 season, this Monday you can discover what the away shirt will look like. The strip is already on sale at Nike.com, stores and official distributors. The new Nike away kit will be yellow, in tribute to the shirt worn during the 2005/06 season, when FC Barcelona won the double, including the second Champions League in their history. It should be remembered that yellow has historically been a lucky colour for Barça, and was also present in the second kit during the 2008/09 season - the camapign corresponding to Barça’s first treble. The shirt includes blaugrana blue and claret flashes on the sleeves, representing the characteristic blur of speed, while the neck will have a blue trim. The design also includes a 'Senyera' flag on the back of the neck. 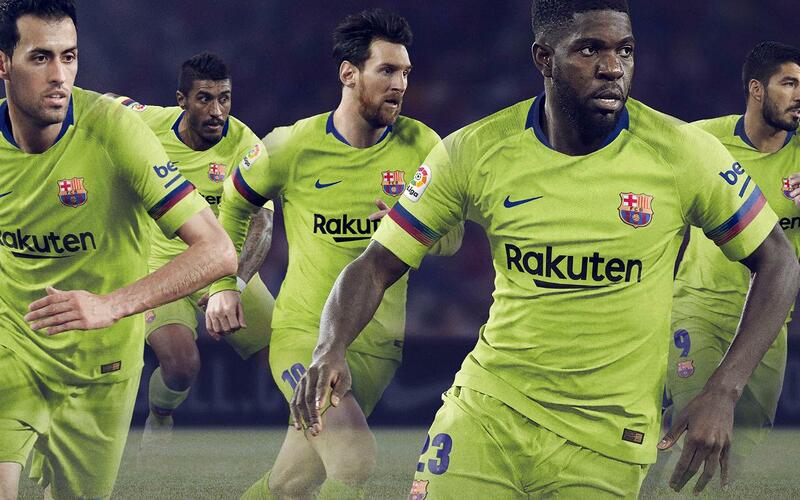 The shorts and socks for the kit have also been designed with the same yellow hue, with some blaugrana flashes in a nod to the home kit..